OP, I told you 245/40-19 will most likely rub upfront. When I suggested 235/40-19, you were concerned regarding load (even though you were on 235/35-20 with 92 load before). 235/40-19 XL tires have more than enough load of 96 for W212. Tallest 19" sidewall that fits front of W212 is 235/40, the most proper tire though is 255/35-19, OEM size on E63, also with load of 96. If idiots at Discounttire won't install them, there are many other places who will, including your MB dealer. Agreed. I figured it wouldn't fit but the Discount Tire store would not install anything else and claimed that there were no issues. Really it is just revealing that they aren't the most knowledge bunch at this location. I am proceeding with 255/35-19. C63 507 forged 19’s 245 35 and 265 30 perfect fit on W212. Ooooh I like. What year c63? I. Assuming they are staggered, what are the width and offsets? Not sure which years they made 507 editions. I bought them used. 19x8 et45 and 19x9 et54. 2353519 and 2553019 were oem sizes and would go to 24535/26530 or 23540/25535 replacements. For sale in the classifieds. I really like those, and I see your ad, I think it's probably a fair ask, but I just can't bring myself to pay thousands to replace wheels on a car when I don't completely dislike what I have. 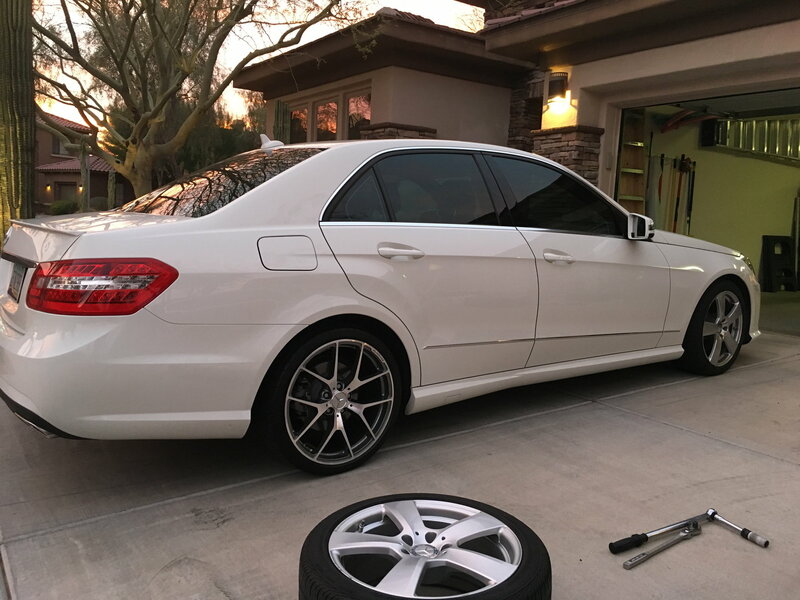 I found a couple of local ads for sets of nice 19x8s taken off brand new E class with tires for $1500, which would be great if I can use up the tires, but if I need to go from the included 245/40 to a 245/35 profile, then the tires are useless. I hear you. I go through rims constantly. Always deals out there. Just remember that some rims hold their value if bought at a good deal. I’ve driven many wheels and sold them afterwards for same after using the tires up. Keep at it and something will will come up. Update: I had DIscount Tire swap in the 245/40 for 255/35. I was able to fully lock my steering wheel with no issues and 90% of rubbing issues were resolved. However on very extreme dips I would get a bit of a rub in the front. I suspect now that it has to do with the 32 offset on the wheels I am riding on (Mandrus 23's). Thankfully these are not the wheels I bought. My actual wheels had not come in yet so I adjusted my order from 32 mm offset to 43 mm offset. Hopefully that should be the end of rubbing.